Only this first welcome page is written in English. The following pages are only in German (at this stage). History of telecommunications - from the beginning to today's digitally connected society. Since the opening on 18 February 1995 with approx. 900 exhibits, we had over 40,000 visitors. "Greuterhof", Hauptstrasse 15, CH 8546 Islikon/TG, near Frauenfeld (map). The museum is open to the public on Sundays from 2-5pm, except in July and August & on public holidays. Guided tours (also in English) can be booked via info@telephonica.ch or tel. +41 52 375 27 27 (Tourism Office, Frauenfeld). The museum is located in the attic of the Greuterhof and has no lift and therefore is not handicapped accessable. 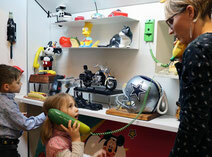 The telephone museum exhibits inventions going back 200 years and shows how they are working. 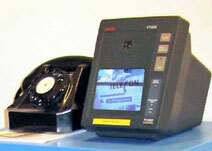 Membership of the telephone museum: More than just a good feeling!